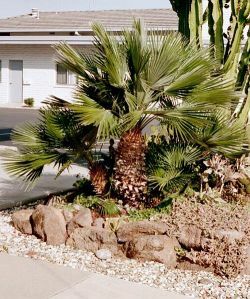 Comments: Fan palm native to Europe and North Africa. Leaves of this palm have a waxy coat on the bottom surface of the fan. A small frost resistant tree to 15'. This tree has been tentatively identified as Chamaerops humilis.